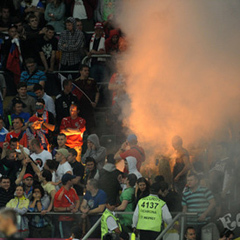 Warsaw - UEFA on Wednesday fined Russia €120 000 after their fans set off and threw fireworks at their irst Euro 2012 match and threatened to dock points off their next qualifying campaign if supporters misbehave. "The UEFA Control and Disciplinary Body has today (Wednesday) decided to impose a deduction of six points on the Football Union of Russia (RFS) in the qualifying round of the next UEFA European Football Championship," it said in a statement. "This decision is suspended for a probationary period running from now until the end of the playoffs of the next UEFA European Football Championship (UEFA Euro 2016). "The Football Union of Russia (RFS) has also been fined €120 000."